Fight and act out aggressively. So How Do You Establish Choice in Training? One example of bringing choice into training is by establishing two way communication. Two way communication is a form of communication in which one organism is the sender and they transmit a message to another organism, who is the receiver. When the receiver gets the message, they send back a response, acknowledging the message was received. This differs drastically from the traditional one way communication where the trainer tells the horse to do something, and his response of feeling uncomfortable doing it goes unacknowledged. I break 2 way communication down in a few different ways. First by looking at the function: Is it a signal to start a behavior or end it? Next by looking at the method used. Is it natural or conditioned (trained)? What I would refer to as a natural end signal involves watching the animal’s thresholds for signs they are about to react. In my 5 Golden Rules Course, I define a threshold as the horse’s physical, mental, or emotional boundary; crossing the threshold causes the horse to go into one of the three reactions (fight, flight, or freeze). There are so many examples of thresholds and how to identify them, so I’m going to keep it simple here and if you want more information you can look into my Online Membership or the 5 Golden Rules. Conditioned End Signal: An example of a conditioned end signal would be a hindquarter yield when I am training a horse to accept the rider for the first time. 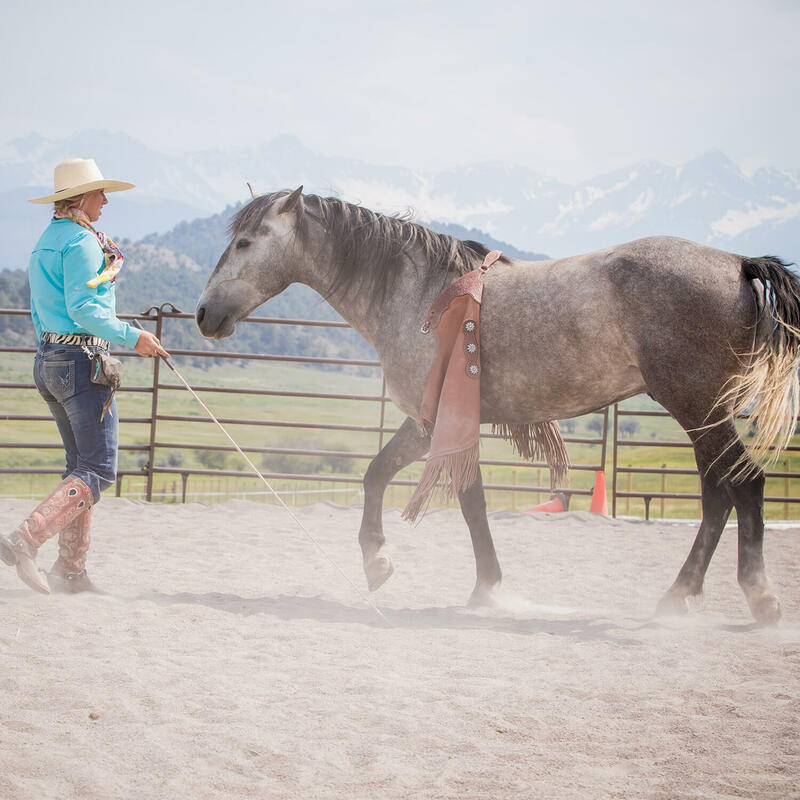 I train the horse from day one that if he is uncomfortable with something on his back, all he needs to do is yield his hindquarters and I will immediately take the object away (Learn more in my membership video library). This allows the horse to express his fear, but in a way that keeps the horse and myself safe so that it doesn’t result in a buck or a bolt. It’s unrealistic to ask our horses to never be afraid, but it is possible to teach them ways of communicating that fear in a healthy way. Natural End Signal: Here’s a crazy example with a mere fish! When cleaning tanks, it becomes necessary to remove the fish from the tank until the cleaning is done, meaning the fish needs to be caught. Chasing the fish with a net to capture them can cause fin damage and also increases anxiety. If the fish is caught with a net, he won’t eat for a day or two once he is put back into the tank. This is a form of one way communication because the fish is clearly saying “I’m uncomfortable” by swimming away yet the person continues anyways and the fish’ communication goes unacknowledged (I know, I know, sounds crazy it’s a FISH right!? Stick with me here). An alternative method using two way communication involves teaching the fish to swim into a jug. Instead of quickly scooping when the fish is near, the handler stops movement when the fish turns towards the opening. Every time the fish turns towards the opening, that is his first sign of approaching threshold or reacting out of fear. This movement is acknowledged by the handler and movement of the jug is brought to a stop until the fish turns and swims nose first again into the jug, signaling he is ready. This is an example of a natural end signal rather than a trained one. Naturally, the fish will turn to leave before exiting the jug. Every time his fear is acknowledged, trust is built and the fish feels control over the situation. And once a fish that has been transferred in this way is released back into the tank, he is able to eat right away, reflecting the reduced levels of anxiety. Amazing! If end signals can be acknowledged to reduce stress levels with a mere fish imagine what they can do for your horse! In my 5 Golden Rules Course I had a wild mustang with anxiety issues around touch come. Within one session of acknowledging the horse’s thresholds and end signals regarding being approached and touched, anxiety diminished drastically! Natural Start Signal: The marine mammal training center I studied at had several exotic birds that proved to be excellent teachers. One was a Gold Macaw who had been successfully rehabilitated from a host of aggression issues around being handled. When I asked the trainer about the process she used, I immediately recognized the two way communication at work. She said that she would open his cage door and offer her arm there at the front. If the bird showed signs of being at threshold, she stopped and didn’t proceed with the behavior (rather than swooping in anyways, risking getting bit). If, however, the bird showed readiness and picked up his foot to step on, she moved in closer and he stepped on with ease. It is amazing the impact that giving choice and a level of control to the animal has on reducing fear. In my 5 Golden Rules Course I had a wild mustang with anxiety issues around touch come for training. Within one session of acknowledging the horse’s thresholds and end signals regarding being approached and touched, anxiety diminished drastically! Conditioned Start Signal: The example with the macaw was a natural start signal as it naturally occurred in training. A conditioned start signal is not naturally apart of the process being used. Let’s look at an example. The center I was studying at allowed tourists to come in and swim and interact with the dolphins. One of the behaviors the dolphins were trained to do was a dorsal swim, in which they would lay on their back, belly up. In this position, they would pick up a tourist, who would hug their belly side and go for a ride. You can see in this swim how trusting the dolphin must be to present themselves in such a vulnerable position. 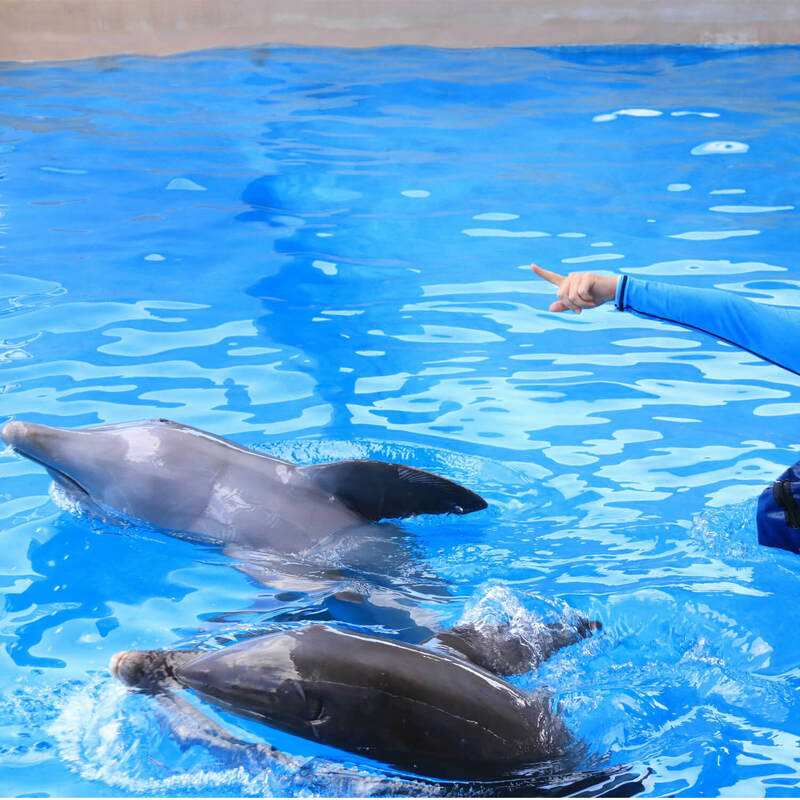 In order to create trust and give the dolphin control over the situation, the trainers always started this behavior by sending the dolphin to a specific stationary target alongside the wall. If the dolphin eagerly went to the target, that was their start signal. “I’m ready!” If the dolphin hesitated, that was their communication they didn’t feel comfortable with starting the behavior. I then applied the concept of the start button technique to working with wild horses and green horses to introduce behaviors such as accepting touch (by hand or various fear-inducing objects such as ropes, saddle pads, tarps, etc) and husbandry behaviors such as needle and vaccine preparations, handing feet, etc. I was astounded by the results!